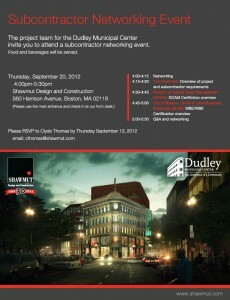 The project team for the Dudley Municipal Center will be hosting another subcontractor networking event on Thursday, September 20, 2012 from 4pm to 5:30pm at the Shawmut Design & Construction offices at 560 Harrison Avenue, Boston, MA 02118. 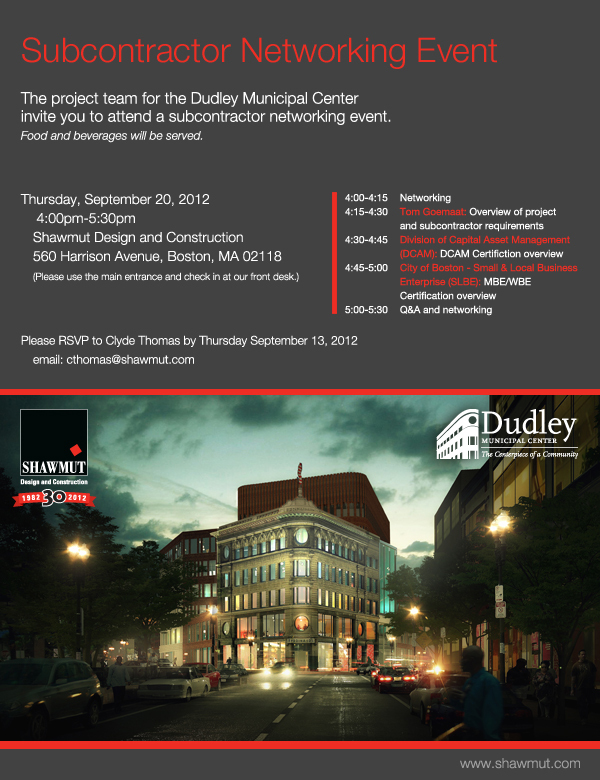 Please RSVP to Clyde Thomas at ShawmutDesign & Construction cthomas@shawmut.com, or 617-622-7248. Clyde Thomas is located at the Dudley Municipal Center’s Field Office at 22 Warren Street, at the corner of Taber Street. (Remember, the subcontractor networking event will be held at Shawmut Design & Construction’s main office at 560 Harrison Avenue). The objectives of the event are to promote networking among local subcontractors interested in potential participation in the Dudley Municipal Center or other projects. There will be a discussion of DCAM Certification, general subcontractor requirements, and Small and Local Business Enterprise (MBE/WBE) Certification. This entry was posted in Construction, Jobs / Contracts. Bookmark the permalink.